"Emma Jean sees the world a bit differently from most of the seventh graders at her school. She is a master of observation, though she doesn't always understand why people act the way they do. She remains detached and it's very hard to get under her skin, so even though she doesn't have any friends her age, she's not bothered by that fact. When she comes upon Colleen crying in the bathroom, Emma Jean discovers that she can use her problem-solving abilities to help her fellow students. And so she proceeds to "help" Colleen with a project that eventually backfires mightily. Colleen is pretty much the exact opposite of Emma Jean. She lets EVERYTHING get under her skin and is quite prone to crying in the bathroom (or her bedroom or her church or the car or...). At first grateful for Emma Jean's listening ear, Colleen is horrified when she finds out what Emma Jean's done to help. Colleen is certain her life is over. When she's finally able to talk out her problems, she finds that maybe what Emma Jean did was not so bad. And maybe Colleen needs to take another look at her own perceptions of the people in her life. I feel like I say this about every book I like, but Emma Jean has unforgettable characters and it's both funny and touching. This book explores the meaning of friendship and popularity without being preachy or scandalous. I really enjoyed it." Read more reviews at The Reading Zone, Fuse #8, Kidsreads.com, A Year of Reading, Shelf Elf, A Patchwork of Books, and Semicolon. 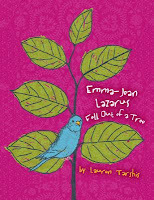 Check out Lauren Tarshis's website and be aware that there's a sequel coming in May: Emma-Jean Lazarus Fell in Love. I found this to be a very interesting book. Did you know that it has been nominated for the Rebbecca Caudill 2010 Award? It made the top 20 Rebbecca Caudills. I was impressed with this novel and hope to see it presented with numerous awards. I would definitly recommend this book to others.